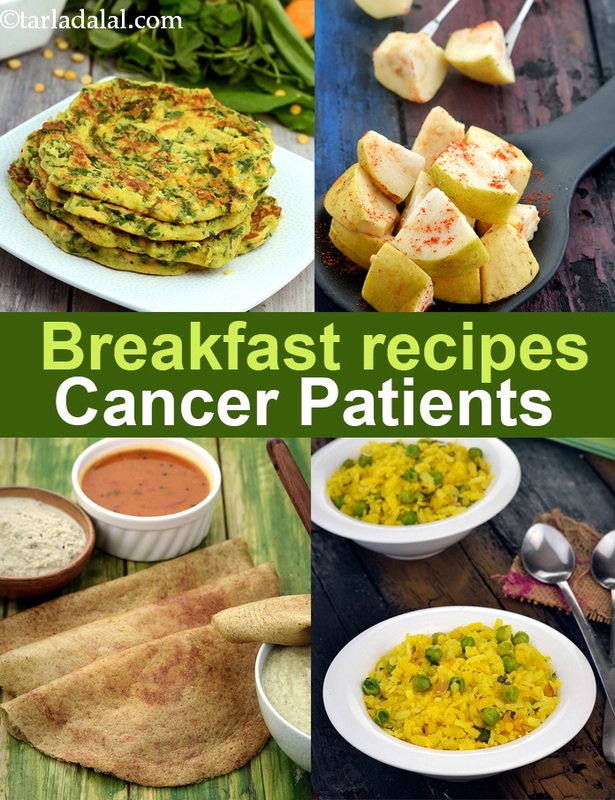 Breakfast for Cancer patients, Healthy Veg Cancer Breakfast Recipes. Breakfast is the most important meal of the day. You have been fasting through the night. You need to give your body a kick start with right nutrients to sustain throughout the later part of the day. Breakfast boosts your energy levels providing you the ability to perform all your chores. Your main aim should be to keep your weight constant – neither lose nor gain weight. Both are equally harmful. You need to start your day with recipes that are rich in protein and energy as well as fiber and antioxidants from fruits and veggies. Nutritionists recommend adding whole cereals to make up for your calorie requirement. Reach out for jowar, bajra, buckwheat, ragi, oats and barley, quinoa, amaranth while avoiding the refined flour (maida) in the form of breads and biscuits. Choose a main dish like the Jowar and Vegetable Porridge, High Fiber Chilas or Buckwheat Groats Strawberry Porridge. Well, the flours of these grains are also not a bad choice. You can combine different flours available in your pantry and create a Multiflour Roti or thalipeeth like Jowar Bajra Besan Thalipeeth. Since cancer patients often experience loss of appetite, it is best they enjoy a portion size that suits them individually. Do not eat very less that the purpose of breakfast doesn’t get fulfilled and do not go overboard in first meal of the day too. You know that your cells and tissues are being destroyed at a faster pace. So you need to stock up on protein on daily basis for sure. Remember you are what you eat. A good amount of protein intake will help in decreased risk of infections further and help in gradual recovery of cells as well. Good vegetarian sources of protein include dals, pulses, sprouts, dairy foods like curd and paneer and nuts. Explore the culinary world with these ingredients and go healthy. We suggest options like Methi Moong Dal Dhokla and Sprouts Pancakes. Combining a cereal like a rice with a pulse like a dal enhance the protein availability of the food. Our ancestral method of cooking khichdi is a classic example of this ideal combo. But khichdi is definitely not a good breakfast option. We have some ideas for breakfast here – Adai, Moong Dal Dosa and Kanchipuram Idli. Non-vegetarians can experiment with eggs to create recipes like Egg Bhurji. Vegetables are not just to make subzis in a kadhai. A health conscious will look out for all means to add it to anything cooked at home. Yes, breakfast should also include all kinds of veggies that you love - be it capsicum, green peas, broccoli, cabbage, cauliflower etc. Veggies are a good source of vitamins and minerals necessary for all body functions. The top up antioxidants to your meals which will help you fight cancer cells by way of building your immune cells ( white blood cells). Be a little more creative to please your taste buds daily. Try and cook options like Oats Mutter Dosa, Vegetable Oats Pancake and Broccoli Paratha. Cooking and serving creatively is a means of tempting one to eat what you have cooked. Fruits – just the name itself puts off many. Though there are many fruits to explore, each one of us love only a few of them. No problem, continue with the fruits you like. But ensure you eat at least one new fruit for breakfast. In fact in a day target to eat at least 3 to 4 fruits. Have oranges, sweet lime, strawberries, grapefruit, amla, guava etc. for vitamin C; banana for potassium; peach, mango and papaya for vitamin A and avocado for other antioxidants like lutein. Try something so simple as Healthy Guava Snack. If you are experiencing nausea, very commonly seen in cancer patients, try making a juice by combining 3 to 4 fruits and keep sipping on it. This will help to get your share of nutrients and overcome nausea and vomiting symptoms too. Strawberry, Pineapple and Orange Juice is one such recipe you can try. This bright orange coloured drink is sure to please your eyes and throat both. Almonds and walnuts also known as badam and akhrot respectively are among the top healthy nuts for you. Amongst the seeds opt for sunflower seeds, chia seeds and flax seeds. They provide you the necessary omega-3 fatty acids which can help reduce inflammation and fight cancer. You don’t need to cook something special with these nuts. Just form a habit to pop 6 to 8 nuts before beginning your breakfast. The seeds can be added to porridge, rotis or parathas you make. We have shown the use of flax seeds in Oats Flax Seeds Roti. And if you missed adding them to breakfast on some days, do not worry. Eat them between meals as a small snack. If you are in to do some unique trials, do look into our tested recipe of Oats Apple Almond Milk Healthy Smoothie. This includes a cereal and a portion of nuts too. So this is a complete breakfast you can offer yourself on days you have a low appetite, which is very common in those suffering from cancer. Few more healthier smoothie concoctions are Papaya Pear and Yoghurt Smoothie (makes use of sunflower seeds) and Peach Yoghurt Smoothie (makes use of chia seeds). Try and avoid adding sugar please. It’s your biggest enemy and best friends of cancer cells. Add dates, raisins, prunes if you like your smoothie little sweet. START YOUR CHOICE OF BREAKFAST HERE….. Enjoy our Breakfast for Cancer patients, Healthy Veg Cancer Breakfast Recipe and other cancer recipe articles.